From menus to window sticker, we’ve got all your print needs covered. Your brand should entice your customers. Your brand tells your story. With Adare, our print and merchandising partner we can help give your brand that voice through. With years of experience working globally with household brands we curated a package of services to deliver maximum benefit to our restaurant partners. Adare International delivers an innovative suite of outsourced marketing services, to some of the world’s most recognisable brands. As the UK’s leading Print Management and Promotional Goods provider, Adare provides an end-to-end service – from helping create the artwork, managing all aspects of production, to timely delivery to your door. 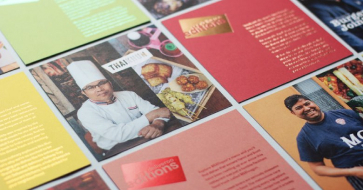 They can help you source every form of marketing and operational print – whether that's menus, window clings, floor graphics, leaflets, till-rolls, posters, signage and pull-up banners. And they're on hand to help wth promotional merchandise too – from acrylic menu holders, balloons, glassware, to lots of bespoke products. Just let Adare know what you need, by clicking on the ‘I'm Interested’ teal link at the top right of the page. One of Adare team will call you back to help.